After a comically anemic first two weeks of May at the box office, the final installment of the Star Wars saga is about to give us our first blockbuster weekend of the summer. We think. I mean, we're pretty sure. 50/50? For a large part, the run up to the release date of Star Wars: Revenge of the Sith has resembled a funeral march as much as anything else, and not just because of the supposed dark subject matter. Some are mourning the end of one of the biggest franchises of all time, others dreading the possibility of a film as bad as the first two installments of the prequel trilogy. Of course there are those that expect the film to be great, but then again, Charlie Brown always thought he was going to get to kick that football. On another hand, the required darkness of the material, one of the worst kept secrets in movie plotting, has many optimistic that George Lucas will be able to pull off this final portion of his cash cow, er, I mean, epic fable, by forcing him to avoid the cutesy characters and incompetent love stories that plagued the first two films of this recent group. Some initial reviews have praised it, saying that Lucas got it right, finally, again. Others say it's got the same old problems, and beyond being bright and shiny, it has little to impress. That Lucas's tin ear for realistic dialogue remains is beyond question. Same ol', same ol', really. Then again at this point, we might be willing to settle for bright and shiny. When it comes right down to it, just about nothing short of nuclear war is going to keep the die-hards away from this film first weekend, and someone out there probably has a lead-lined stormtrooper suit just in case. Opening day figures for both of the recent prequels stand at $28.5 million and $30.1 million, both impressive figures, and both, at the time, records for non-weekend days. 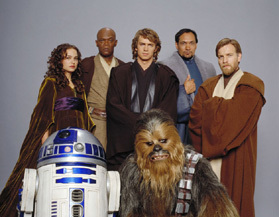 However, the blockbuster culture has since passed these films by, and the top day ever for a Star Wars film, the first Saturday of Attack of the Clones at $31.3 million, is only the 16th best one-day take in box-office history, falling behind a mish-mash of outings from Harry Potter, Spider-Man, Lord of the Rings, The Matrix, Shrek and even a day out of The Passion of the Christï¿½s run. It's just another blockbuster now, albeit with a slight more fervent (and pungent) fan-base than most. Even so, it seems like they're lacking the same passion as in previous outings, with the event taking on the air of an obligation - if you've seen the first five, you might as well see this one - and stragglers are not bothering so quickly. There are midnight showings on the first night as with the last two, which was responsible for approximately $7 million of each film's first-day figure. That's likely to stay constant or maybe tick up a tad due to ticket inflation, and initial box office should do likewise all-around to some degree. Average filmgoers are still likely to wait until after the first weekend as they did with the past two films, which is likely a big part of why the opening weekend figures of the last two Star Wars films failed to reach the heights of other, supposedly lesser profile films. Another somewhat limiting factor is the screen count, which sits at "only" 3,661, short of the upwards of 4,000 we're likely to see for many summer hits this year. When all is said and done, Revenge of the Sith should bring in an opening day figure of $34 million, and a three-day opening weekend figure of $92 million. It's got a good shot to end up somewhere in the top five opening weekends of all time, but also fall short of the century mark reached by the two Spider-Man films and Shrek 2. Where it goes from there is entirely up to its quality. On the off chance you want to see a different film this weekend, there's a fine selection of films already deemed unworthy and not up to summer standards by the movie going populace. A distinct lack of counter-programming choices are offered as new films (a distinct lack of anything, for that matter), but there is one represented by last week's number one film, Monster-in-Law, which opened to $23 million. Counter-programming can be overrated at times, as nothing can help a film people don't want to see, but Lopez and Fonda seem to have struck at least a minor chord in their Battle of the Divas. Give it $16 million for its second weekend. Kicking & Screaming took second spot with $20 million, and basically proves Will Farrell could open a jar of pickles to about this much, as the film was all him acting out the "Will Ferrell" character and not much more. As the highest profile comedy of the weekend, it's got a fighting chance, but don't look for any saving grace from sellout overflow. Its second weekend should bring in about $12 million. Unleashed was Jet Li's worst showing since he became an established martial arts star, earning just $10.9 million, when his recent average is almost double that. A lower screen count combined with perhaps an unpalatable plot (people care about the plot? News to me) were two of the likely culprits for this showing. It should see a steep drop this weekend, to about $6 million. Although it opened to just $9 million, Crash is starting to angle towards a sleeper position for the summer, falling just 22% in its second weekend. The ensemble film is definitely striking chords, and not just with critics, who have hailed it as one of the year's best films so far. It should continue to make an impact through at least the early part of the summer, and is good for another $5-6 million this weekend. Kingdom of Heaven is an early candidate for flop of the summer, with its expensive $130 million price tag, and a relatively miserable opening weekend figure of just $19.6 million. Foreign box office may prove to cushion that blow, but it will be difficult to justify this film's cost unless its likely domestic total of about $60 million is balanced by a three or four-fold foreign figure. It's likely to drop to around $4.5 million this weekend.